BOO! It’s chocolate bread time! That’s right, not chocolate cake, but chocolate bread! This chocolate bread recipe is so easy to make and chocolaty and creamy made with Nutella! 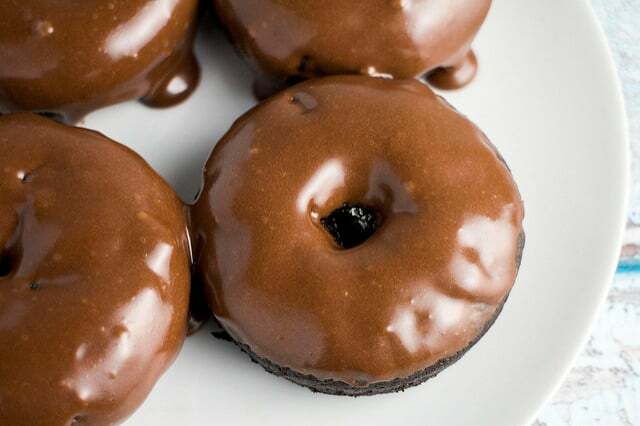 UM YEAH – NOM NOM NOM! 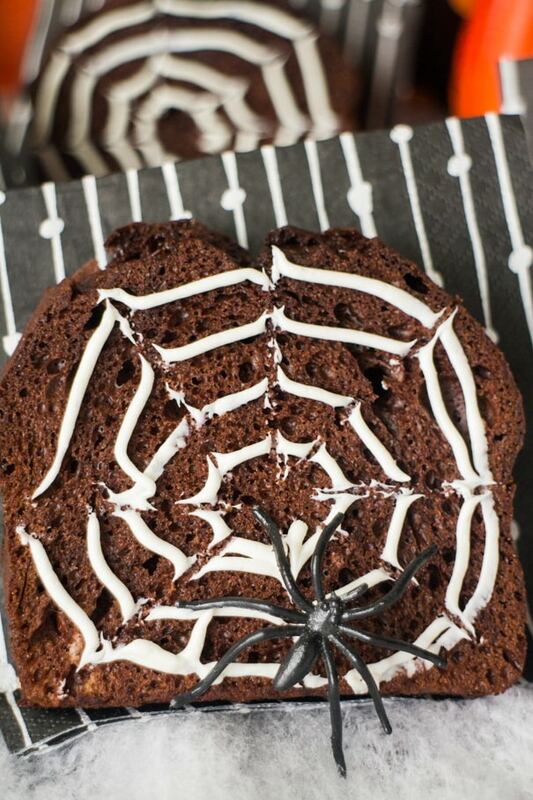 Bake this bread in a loaf pan and then cut into slices to decorate with white frosting spider webs! Save this recipe for Halloween! This chocolate bread recipe is oh so moist and super fudgy, thanks to the 3/4 cup of Nutella we’re adding in. The chocolate is caused by the cocoa powder that we’re adding in too. This bread has the same texture of a moist cake, but in bread form. Everyone loves it! The recipe is easy to make and takes 60 minutes to bake. You’ll need a bread loaf pan to bake the batter in. You’ll add flour, cocoa powder, baking soda, salt, cinnamon and nutmeg in a large bowl. Those are your dry ingredients. Don’t they scream Fall flavor too? Then you’ll grab 2 ripe bananas, you know those banans that you left go brown. They are PERFECT for this Chocolate Bread! Now mash them up in a bowl, I just use a spoon or fork and mash them. Now add your softened butter, brown sugar, eggs and Nutella in another bowl. Mix it all up. After that add your wet ingredients into your dry ingredients bowl and mix until everything is combined. After it’s mixed, pour the mixture into your bread loaf pan. Bake for 60 minutes. Allow it to cool before removing from the loaf pan and cutting the bread into slices. 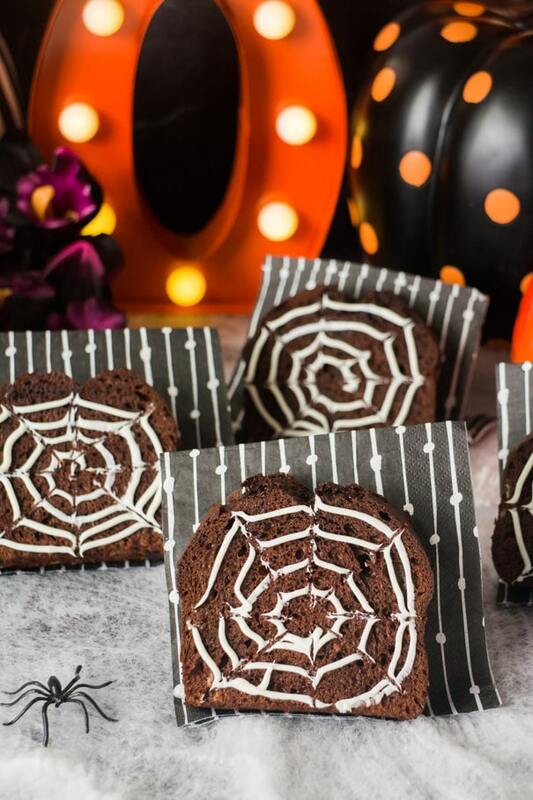 Since this is a Halloween recipe, I suggest you go that extra step and make spiderwebs out of vanilla frosting – but if you just want to keep it as chocolate bread – that’s totally ok too! Place your favorite vanilla frosting into a pastry bag. You can use store bought frosting or use a homemade frosting recipe. Using a small fine tip, decorate spider webs on each piece of bread, using toothpicks to finely design the webs if you want. 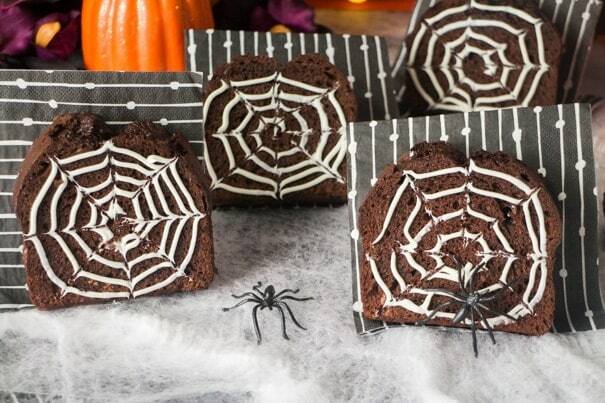 This Chocolate Bread Recipe makes 12 servings, perfect for a Halloween party! If you have any leftovers, or are just baking this for a small family, then you can freeze the remaining slices. 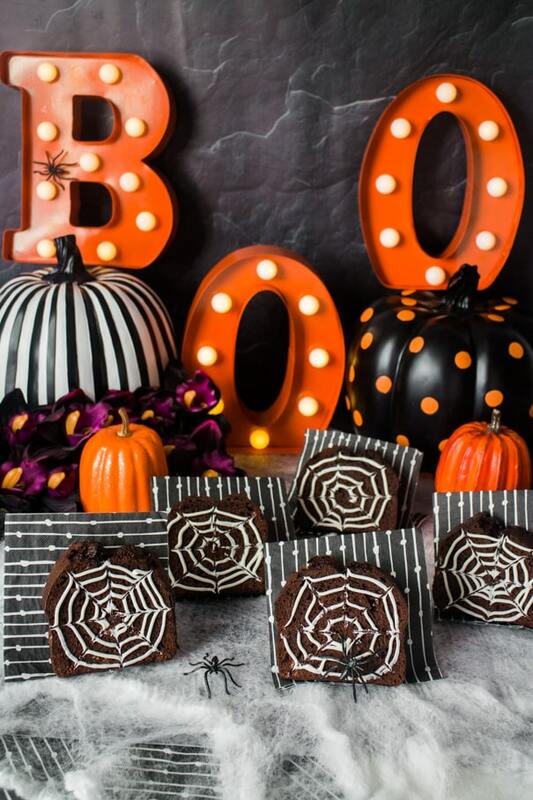 If you’re looking for more easy Halloween dessert recipes try my Pumpkin Whoopie Pies, Eyeball Sherbet Punch and Chocolate Chip Pumpkin Brownies (4 ingredients!). 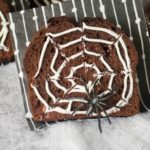 I hope you enjoy this Chocolate Spiderwebs Bread, perfect for Halloween! BOO! It's chocolate bread time! That's right, not chocolate cake, but chocolate bread! This chocolate bread recipe is so easy to make and chocolaty and creamy made with Nutella! UM YEAH - NOM NOM NOM! 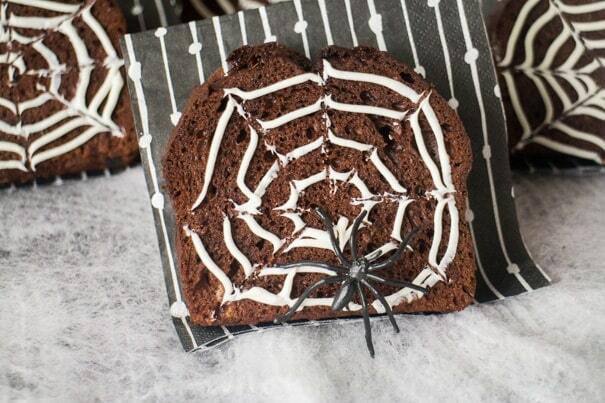 Bake this bread in a loaf pan and then cut into slices to decorate with white frosting spider webs! Save this recipe for Halloween! Preheat oven to 350 degrees. Spray a bread loaf pan with nonstick spray. In a large bowl combine flour, cocoa powder, baking soda, salt, cinnamon and nutmeg. In another bowl mash bananas. Then add butter, brown sugar, eggs and Nutella. Mix with hand blender until combined and creamy. Add wet mixture into dry mixture. Pour mixture into bread loaf pan. Let cool. Using a knife, cut bread into slices. Place vanilla frosting in a pastry bag, using a small fine tip. Decorate spider webs on top, using a toothpick to fine tune and spread webs.